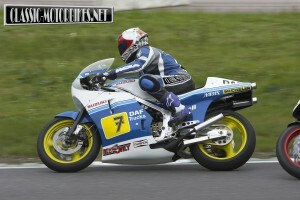 You cannot have visited a major bike show in the UK over the last few years without seeing Pete Tantrum and his RG500. 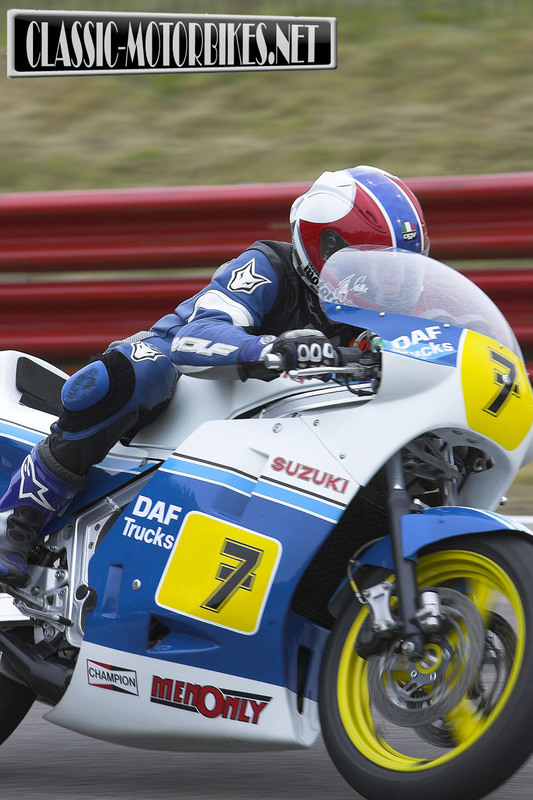 The bike is beautifully painted in the same DAF trucks livery as the one that Barry Sheene last rode with, the bike looks stunning and stands out from the crowd wherever it may be parked. It began life as a red and black RG and from the moment Pete acquired the bike the end result was clear in his mind, if not quite every one else’s. 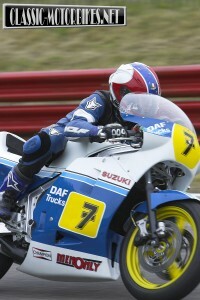 When ever he mentioned a Barry Sheene replica most people immediately thought of the red and yellow Heron machine upon which Barry romped to his two world titles in 1976 and 77 but not Pete, for him the tribute to this great man would take the form of the final year that Sheene rode in GP’s. This transformation from an ordinary road machine into the bike you see today involved much effort from all involved and it is hard to see who has ended up the most enthusiastic about the project, as both Pete and his wife, Zoe appear to be as happy with the results as indeed does the man who has helped throughout, paint guru, Andy Peck. 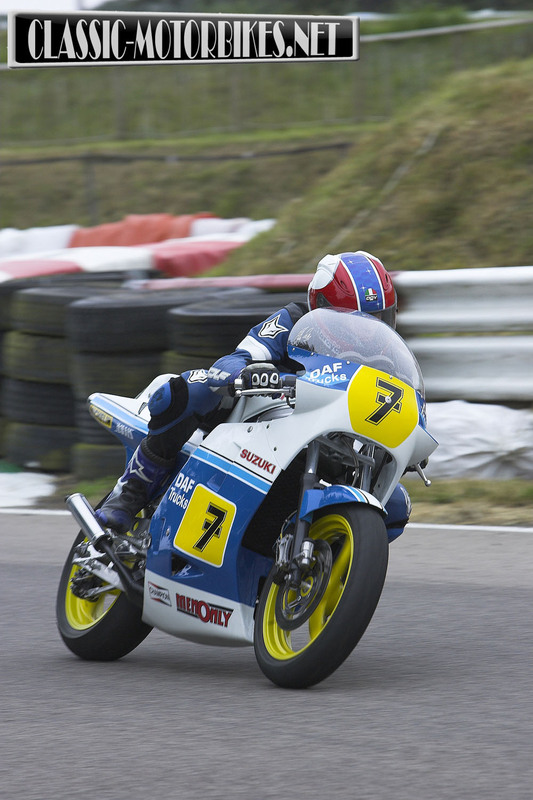 It is a replica, but somehow it seems unfair to label it as such, as so much work and effort and passion has clearly gone into its creation and, with this in my mind, it was with some trepidation that I cocked a leg over it when we tested the bike at a wet Mallory Park. In use it isn’t so far off the real deal, modern rubber, and the efforts of tuning god Stan Stevens, have given Pete’s RG the true feel of a racing thoroughbred. 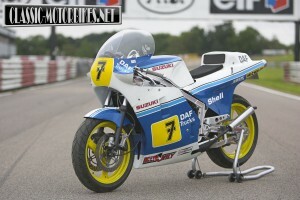 Of course a standard road going RG is a pretty fine machine anyway, but still some way off the level of performance seen by the race machinery, however this lightened and fettled machine is close to the kind of performance enjoyed by the racers of the early 80’s. With 95bhp on tap, around 20 more than a standard road going RG500, and feeling considerably more stocky and business like, the bike literally comes alive, taking off like a scalded cat in the first four gears before regaining its composure and calming down somewhat in the final two ratios. It isn’t just the engine that gets a pep up either, the chassis is somehow tighter than a standard RG, mainly due to the Hagon rear shock and heavily braced swing arm taken from a race RG500 from the late 80’s, while the modern rubber allows the whole plot to swing around with ease. By replacing the 16-inch wheel up front with a 17-inch GSXR600 version the front end is transformed, losing the heavy feel of the original machine and tracking a finer line particularly at speed. 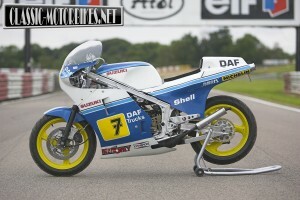 Add to this a considerably wider rear and the RG takes on the mantle of a much more modern feeling machine. At the time of the test the brakes were ok, but, being the standard RG items, could have done with a shade more power, lacking much of the initial bite needed to feel comfortable on the track as well as fading with every lap due to heat build up. Brakes apart and the most noticeable difference between Pete’s RG and Bazza’s can be found in the low and mid rev range and surprisingly the gauge swings heavily in Pete’s favour. Still using the standard RG 28mm carburettor units, the fuelling is accurate and crisp whereas on the 1984 race machine, the 37.5mm open mouthed race unit spit and dribble unused petrol until the engine comes onto song. A set of Swarbrick expansion chambers give a real boost to the final image, both looking, and sounding, just like the real deal with a sharp staccato cackle from the moment the engine burst into life that then develops into a banshee howl as the revs near the redline. Back in 1984, Barry junked the original Suzuki chassis in favour of a specially built Harris steel tube set up using his own requirements regarding head angle etc, Pete didn’t have this luxury and is stuck with the standard road going, box section alloy, frame. This caused massive problems when getting the race bodywork to fit and it resulted in some heavy modifications by the third member of the Tantrum team, Andy Peck of MA Nicholls coachworks of Didcot. Andy is a racer as well as a talented painter and it was he who Pete chose to carry out much of the work, he admits to not being too enthusiastic at first but as the Sheene bug bit he became all ensconce in the project, clearly going that extra mile to create the full effect. Both the race east and fairing had to be extensively modified to get then to line up correctly as the race bike dimensions are so very different to the road going machine. This involved cutting the fibreglass and extending it with matting and sheet aluminium before rubbing all of this down to get a near flawless finish. To create the right racer image all of the usual parts found in and around the cockpit area had to be relocated, the ignition switch is now slung down on the rear engine mount while the switchgear has also been junked. To the average passer by Pete’s machine passes more than a close inspection with a stunning paintjob and tasteful touches in the mechanical department. As time passes more modifications keep happening with the latest being a set of Lockheed calipers from the period replacing the puny RG items and increasing stopping power immeasurably. What Pete has achieved is admirable; the RG has more than just a passing resemblance to the real deal that Sheene rode and is totally usable in the process. Being fully road legal and well set up too Pete Tantrums Tribute to Barry is just as happy pootling around town or ripping up the race tracks in fine style. Pete Tantrum is a lucky man, not only does he own a Barry Sheene look-alike machine, he can ride it to work every day if he so wishes. 1984, George Orwell got a lot of things right in his vision of the future; however he neglected to mention the resurgence of the mighty Barry Sheene. 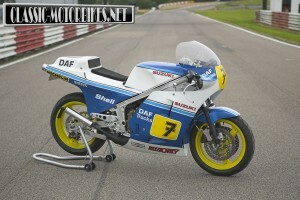 This representation of a Sheene bike brings back memories of just how feisty Sheene was. 1984 was to be Sheene’s last year in any form of modern motorcycle racing, but it was also a time when he simply could not have ridden any better and he was still at the very top of his personal game even if he lacked the top flight tackle to make the best of this situation. 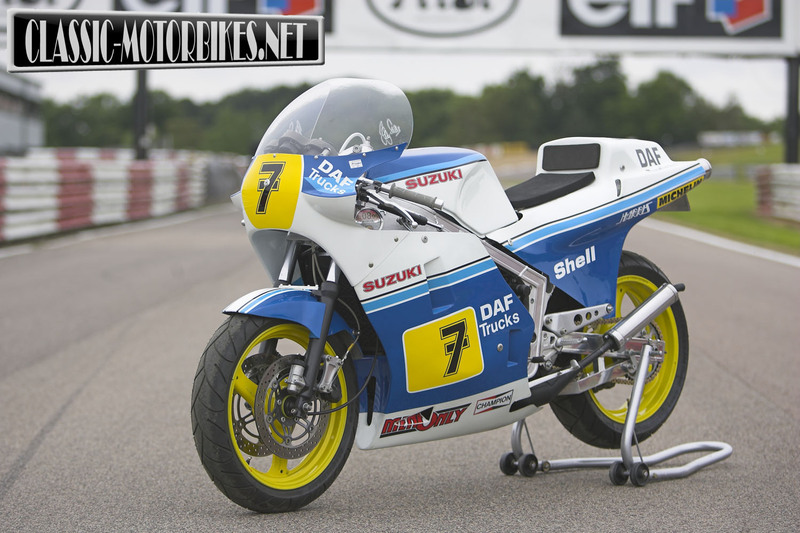 Having been unceremoniously dropped by Suzuki following his back-to-back world titles on the Suzuki XR14 in 1976 and 77, he shifted to the Yamaha camp. 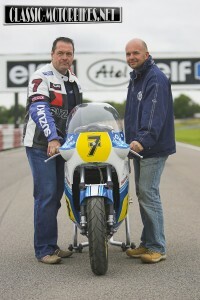 In his role, and as second fiddle to Kenny Roberts, Sheene was never truly given the equipment that was granted to the American, none the less Sheene did show good form throughout, always threatening to out ride his rivals no matter what the pundits or specs sheets told us about his prospects. A huge crash in 1982, just when Barry had been given the latest factory machine for the very first time, almost ended his career. Badly injured and with many breaks to both legs, the pinned and plated Sheene soldiered on in GP racing but this time as a privateer. 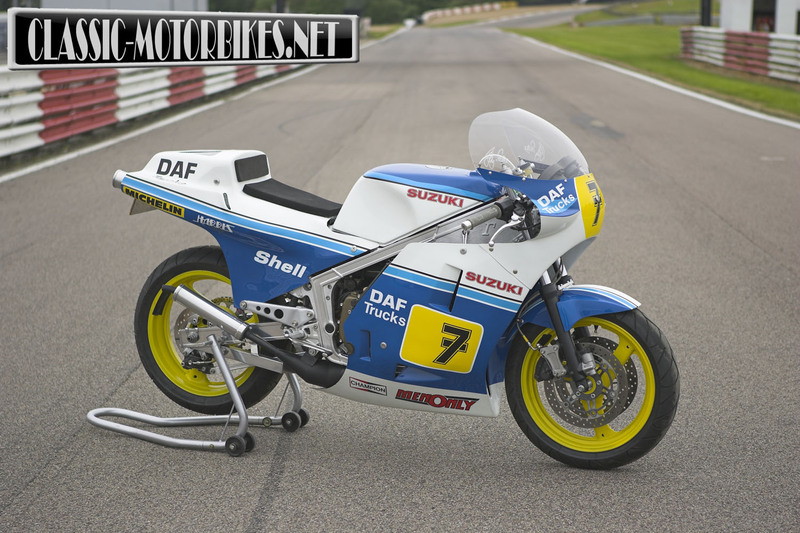 When others would have quit, Sheene put together a brace of customer specification RG500’s and went on to complete some of his best ever rides, never actually wining a race but certainly out performing the expectations of some “old guy” on a shop bought racer. 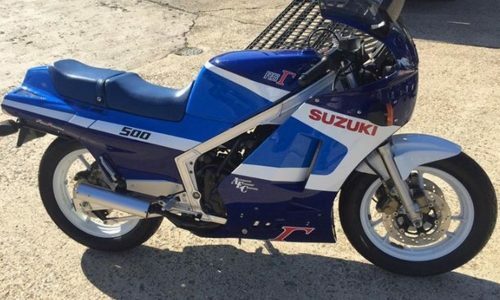 In his own inimitable words, the customer spec RG500 that he campaigned during 1983 “wouldn’t pull a boy scout off your grandmother” but in 1884 he was eventually granted the use of a factory engine albeit an out of date power plant from the 83 season. Suzuki UK did much to facilitate this however Suzuki Japan still held grudges dating back to the split between the pairing in 1979 and blocked all efforts to get Barry on to a full factory XR machine. Despite all of this, and a hatred for riding in the wet, the South African GP of 84 saw what Sheene and many others view as his finest hour. Starting from the back of the grid, thanks to a pair of tired legs that struggled to push start the RG500, he rode brilliantly to finish a valiant 3rd come the finish. In the tricky conditions outright power gave way to sheer talent and nothing held Bazza back from taking one last appearance on the GP rostrum. Barry did retire after this last sterling effort and turned his back on bike racing for some considerable time, forging a new career in TV commentary as well as becoming a successful property dealer in Australia. 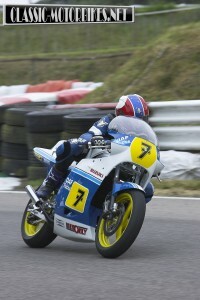 He did eventually give in to pressure and cocked a leg over a classic race Manx Norton, it was clear that despite a break of 16 years or so, none of the old skills had been lost and pretty soon Sheene was the force to be reckoned with in this form of racing too.